Yesterday I was invited to go along to the Out of the Woods festival in Bute Park, Cardiff. There was all sorts going on, from a coracle rowing demonstration, to a birds of prey display (I held a very cute white Barn Owl), to basket weaving as well as every type of dog you could imagine, including a poodle with a very sparkly “bling” collar!! I was there to support SARDA, the South Wales Search & Rescue Dog Association in raising awareness of the charity and chatting to potential volunteers. I also presented a prize in the Four Paws Dog Show. The Dog Show was open to all, with categories for the ‘waggiest tail’ to ‘best puppy’. 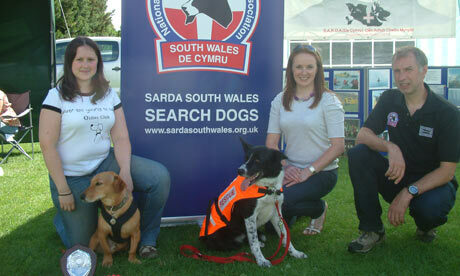 Amy (left below) and her dog Louie won the prize for ‘best rescue dog’ and received a trophy from SARDA & Four Paws. Both charities are heavily reliant on donations to fund their activities, and most importantly the willingness of volunteers to assist them in the day to day running of the organisations. Volunteers with SARDA South Wales can help to train search and rescue dogs by hiding from them during training to provide a human scent for the dogs to practice finding, help with fundraising activities, or with the necessary experience even become a search dog handler.